Bicycle and University car parking access will remain. Drivers will be required to present their University parking permits to the on-site Security Officers prior to gaining access. A short section of St Michael’s Park between the rear of Senate House and the Centre for Sport, Exercise and Health will be closed to through vehicle traffic from Monday 18th September until Friday 29th September. The closure is to allow Wessex Water to carry out essential repairs to the sewerage network. Access to University buildings and car parks will not be affected but diversions will be in place for through traffic. From 11 January First Bus are making changes to some services in and around Weston-super-Mare, North Somerset and Bristol Bus Station. As well as making changes designed to improve the punctuality and reliability of buses overall, the route that buses take Monday - Saturday daytimes is also being adjusted. From 11 January buses will no longer serve Martindale Road or Corondale Road but will instead travel directly along Locking Road. Daytime journeys from Worle, towards Searle Crescent, will also follow a slightly revised route up to 7pm. Specifically from Sainsburys they will operate a one way loop via Queens Way, Wansbrough Road, Walford Avenue, The Avenue, Jubilee Way, Pastures Avenue, Walford Avenue, Queen's Way, before re-joining the current route. This change follows requests from local people and restores a service to St Georges. Buses travelling in the opposite direction, and services running after 7pm Monday - Saturday are unaffected and will continue as they are. Some minor changes are being made to the timetable and the route to reduce journey times and improve the punctuality and reliability of the service. From 11 January buses travelling towards Worle will follow a revised route around Weston-super-Mare town centre. Specifically on leaving Regent Street they'll go via Princess Royal Square and Royal Parade only, and will no longer travel via High Street, Oxford Street, Beach Road or Marine Parade. This change reduces the time taken to complete each journey. There are no changes to the route taken for journeys towards Oldmixon. As a partial replacement for the withdrawn Service 121, a new Service 21 is being created. The route, which is being financially supported by North Somerset Council, will provide two morning and two afternoon journeys connecting Felton and Bristol Temple Meads. The timetable has been designed to appeal to commuters. In travelling between the two points, buses will also provide connections to and from Winford, Bedminster and Bristol City Centre. Some journeys have been re-timed to improve punctuality and reliability. Customers are advised to check the new timetable before travelling. This service is being withdrawn, but it is being replaced by an enhanced Service A2 which will improve the frequency of buses for many people who previously used Service 121. A new Service 21, which has been designed to appeal to commuters travelling between Felton in North Somerset and Bristol Temple Meads, is also being created. People living in Wrington may wish to note that the route of the new Service A2 through the village will be different from the previous Service 121. Buses will not serve Long Lane, but instead they'll travel via Half Yard, Station Road, Broad Street, Silver Street and Havyat Road. Following a comprehensive review of the service carried out in partnership with North Somerset Council, some changes are being made from 11 January. From this date buses, travelling via a revised route between Weston-super-Mare and Nailsea, will run every hour throughout the day, Monday - Saturday. Buses will also run on Sundays and Public Holidays for the first time. This is a notable improvement on the current timetable, which sees just a handful of journeys operate Monday to Friday. Buses will start and terminate at Weston-super-Mare (Railway Station) serving parts of the town (Locking Road, Summer Lane, Churchland Way and Wolveshill Road) and therefore providing links to and from Worle and West Wick. From there buses will serve Banwell, Winscombe, Sandford, Churchill, Langford, Wrington (providing links to Butcombe Brewery), Redhill, Bristol Airport, Brockley Combe, Backwell and Nailsea. A new link to and from the Holiday Inn (Bristol Airport) will also be created. The timetable of the new Service A2 has been designed with shift workers at Bristol Airport in mind - with journeys designed to arrive for 0600 hours and depart after 2200 hours. Moreover timetable connections with other services have also been considered. People who wish to make onward journeys towards Bristol City Centre will have the option to change buses at Backwell (for Services W1, X1, X8) or in Weston-super-Mare (for Services 126, W1, X1). It is also possible to travel into Bristol on Service A1 from Bristol Airport however there are fare and ticket restrictions on this airport flyer service. The route that buses take is being amended so that all journeys serve Yatton (High Street and North End), and that links for local people wishing to travel between Claverham and Yatton are created. In addition the timetable is being adjusted to improve the punctuality and reliability of services, while on Sundays and Public Holidays the frequency of buses is being reduced to one bus every hour (compared to every 30 minutes now). Customers should note the changes to Service X1 though, which will offer a faster bus between Weston-super-Mare and Bristol in between the slower, hourly W1 service. The stopping arrangements of buses on this route are changing. From 11 January buses will serve all the stops along the route - giving people the opportunity to board or alight in an additional 20 places. In addition the timetable is being adjusted to improve the punctuality and reliability of services. New journeys on Sundays and Public Holidays are also being introduced. Buses will run hourly on these days, giving people access to a fast, direct service between Weston-super-Mare and Bristol. There are a number of changes to the route of Service X5. In addition all X4 journeys will cease to exist being replaced instead by extra X5 journeys. From 11 January, Service X5 will provide links between Weston-super-Mare, St George's Turn, Clevedon (travelling to this point via the M5, and thereby reducing journey times by up to 20 minutes), Portishead and Cribbs Causeway with most journeys also extended to call at Bristol Parkway and the University of the West of England's Frenchay Campus. Service X5 will no longer serve Congresbury, Yatton or Kenn. Congresbury and Yatton will still be served by the W1 and / or X1 though, and connections to the X5 will be possible at Worle (Homebase). The route extension beyond Cribbs Causeway to Bristol Parkway and UWEs Frenchay Campus is expected to be welcomed by those wishing to connect with rail services at Bristol Parkway, or those wishing to travel to and from the university's campus. In addition to these route changes, the timetable itself is also being amended. Customers are advised to check how the alterations may affect them before travelling. To view the new timetables online please click here. The University's Sports, Exercise and Health department have confirmed the details for the Staff 'shower membership' for Active Commuters (for example staff walking, cycling, jogging/running) successfully trialled previously over last summer. Are requested to make a minimum £5 donation to the nominated charity. The nominated charity will be Life Cycle UK (a local cycling charity) to begin with. Memberships will expire 30 Sept 2015 (as with all staff memberships of the facilities) so will need to be renewed at that point. Staff will use their Ucard as membership card. Any queries should be directed to John Wilford , Healthy Lifestyle Manager, Sports, Exercise and Health. National Express is taking a fresh approach to affordable student travel at the University of Bristol. As Welcome Week gets underway next week at The University of Bristol, the UK’s largest coach operator is launching a brand new coach service on Saturday (20 September) from the University’s Stoke Bishop Transport Hub. Running directly from the Stoke Bishop Transport Hub – the new service opens up a direct transport link to London for freshers as well as other students, staff and nearby local residents. Comprising six outbound and eight return coaches, the new service provides passengers with a fast, frequent and affordable means of travel. For the first three months, a ticket to the capital starts at a special rate of just £5, while with a journey time of just under three hours – the service is a perfect for a day out or sightseeing trips. The new service from Stoke Bishop compliments National Express’s existing University of Bristol service and reinforces the company’s position as the country’s leading university coach provider. As well as running coaches directly from 14 UK universities, National Express‘s iconic white vehicles call at most university towns and cities putting many campuses just minutes away from the coach station. National Express UK Coach Managing Director Tom Stables said: "Freshers week is one of the highlights of university so we are thrilled to be able to add to that experience by opening this new service that opens up a fast, direct and affordable transport link to the capital. Students can also benefit from the Young Persons Coachcard entitling them to a third off their coach journeys and 10 per cent off travel to top student events such as Glastonbury and Wembley football matches. For more information please visit www.nationalexpress.com or call 08717 818 181. Residents' Parking Schemes are to be introduced across Bristol. The University is formally responding to City Council consultation for areas affecting University operations but encourages staff to submit individual representations as appropriate. The consultation period for each area is different. Consultation times are available here (PDF, 254kB). The Staff Travel Survey has been launched today (14th November 2013) and this is your main opportunity to influence how the Travel Plan develops. To thank you for taking part you will be entered into an exciting prize draw where you could win a meal for two with wine at Hotel du Vin or £20 Amazon vouchers (five up for grabs). The survey closes on 30th November 2013, and will aim to announce the survey results and prize winners in January 2014. If you have any queries regarding the survey or would like further information please have a look at our FAQs document (PDF, 311kB). If your queries are not addressed in this document please email transport-plan@bristol.ac.uk. The University of Bristol Staff Travel Plan is now well established and every two years a staff travel survey takes place. Results from the survey help the Strategic Transport Group (STG) review and refine the way the Travel Plan operates. This is your main opportunity to influence how the Travel Plan develops. With the potential introduction of Residents' Parking Schemes in and around the central University area, which will likely impact on how some staff travel to the University, this year we have included an additional parking-related question. The information you provide, even if you do not drive to work, will be valuable in helping us complete our own comprehensive parking review and assess the impact of the schemes on University operations. Cycle to Work Schemes allow staff to buy a bike a bike tax free and spread the cost by paying through their annual salary. At the end of the hire period the employee has the option to purchase the bike at ‘fair market value’, which is set my HMRC as a percentage of the original cost with the amount decreasing with the age of the bike (see below). The University was an early implementer of a cycle to work scheme when other ‘off the shelf’ systems were not as readily available. As such, the University runs its own cycle to work scheme for University staff which differs from many Universities who use external providers. There are three main external providers of cycle to work schemes each of which provide an excellent service to employees but there are some key differences in the service they provide. The table below outlines this. The University would like staff to choose which scheme they would prefer to have in place.The University aims to select a provider based on your votes by the end of November 2013 and aspires to have scheme in place in January 2014 (Update: due to unforeseen delays we now hope to have it launched by the end of August 2014). Once a provider has been selected we will inform you via the Travel News pages and via the University's Bicycle User Group (TUB-BUG). If you have any questions or feedback on the consultation please email transport-plan@bristol.ac.uk . Users of the existing University cycle tax benefit scheme will be able to carry on as previously arranged. With all these schemes you should insure the bike yourself to protect your investment. Hire period and End of Scheme Details After 12 months paying through salary sacrifice employees can enter an extended hire agreement with Cycle Solutions for further 36 months. If you elect to do so you will be asked to pay a small refundable deposit of 3% or 7% (depending on the value of your bike, see HMRC Fair Market Value table above) and then have nothing further to pay and no further monthly rentals. During the hire agreement period with Cycle Solutions you will not be liable to pay monthly hire payments. If at the end of the extended hire agreement period you do not want to keep the bike and equipment then you are refunded your deposit in full once you have returned the bike and equipment to Cycle Solutions. If at the end of the extended hire agreement period you do want to keep the bike and equipment then Cycle Solutions retain the deposit and you will be sent a receipt for the sale. After 12 months employees can enter an extended hire agreement with Cyclescheme for further 36 months. If you elect to do so you will be asked to pay a small refundable deposit of 3% or 7% (depending on the value of your bike, see HMRC Fair Market Value table above) and then have nothing further to pay and no further monthly rentals. During the hire agreement period with Cyclescheme you will not be liable to pay monthly hire payments. If at the end of the extended hire agreement period you do not want to keep the bike then you are refunded your deposit in full once you have returned the bike and equipment to Cyclescheme. If at the end of the extended hire agreement period you do want to keep the bike then Cyclescheme retain the deposit and you will be sent a receipt for the sale. After 12 months employees can enter an extended hire agreement with Evans for further 48 / 60 months. If you elect to do so you will not have to pay a deposit and you will not have to pay any further rental payments. At the end of the rental period the bicycle can be yours at no extra cost. 12 months. If you wish to keep your bike after this period you must pay 18% the value of your bike (if the orignial price was under £500) or 25% (if the orignial price was over £500). Savings made by employee Typical saving between 39% -48% on the cost of the bicycle and accessories (this includes a 10% discount) if bought online directly from Cycle Solutions. Typical savings between 32% - 42% on the cost of the bicycle and accessories from local bike stores listed above. Use their online calculator to see how much you could save. Typical savings between 32% - 42% on the cost of the bicycle and accessories. For a worked example and use of their online calculator visit their web site. Typical savings between 32% - 42% on the cost of the bicycle and accessories. Use their online calculator to see how much you could save. Low tax & National Insurance savings. Allows staff to spread the cost over a year. A worked example is available on our web pages. £1,000. You won't be able to buy a bike of a higher value on this scheme even if you pay the extra amount outside the scheme. £1,000. You won't be able to buy a bike of a higher value on this scheme even if you pay the extra amount outside the scheme. £1,000. You won't be able to buy a bike of a higher value on this scheme even if you pay the extra amount outside the scheme. £800. You are able to buy a bike of a higher value on this scheme if you pay the extra amount outside the scheme. Langford Students to Enjoy A Convenient New Bus Service! Langford students and staff can enjoy nearly two months of free travel when the new A2 ‘Link’ bus service launches in November.The service starts with a fantastic offer of free travel from 4 November to 27 December. No need to register, just hop on board! The A2 timetable has been specially designed to interchange with the X1 service at Congresbury so Bristol-based students can be on site in time for lectures starting at 9.00am. The bus leaves at 17:24 after lectures finish with the option of a later bus at 18:24. Plus a new bus stop will be installed near the Langford site entrance so you don’t have so far to walk. During the day the bus will operate on a loop in both directions linking Nailsea, Backwell, Bristol Airport, Congresbury, Claverham and Yatton. It will run hourly Mondays to Fridays during peak times from 05:00 to 12:00 and then from 15:50 up to 18:45. The A2 will also stop at Yatton, Nailsea and Backwell stations for rail connections to Weston-super-Mare, Bristol and beyond. The Bristol Airport stop will also be handy for anyone catching a plane! Bristol City Council are developing proposals for new residents’ parking schemes in areas around the city centre. 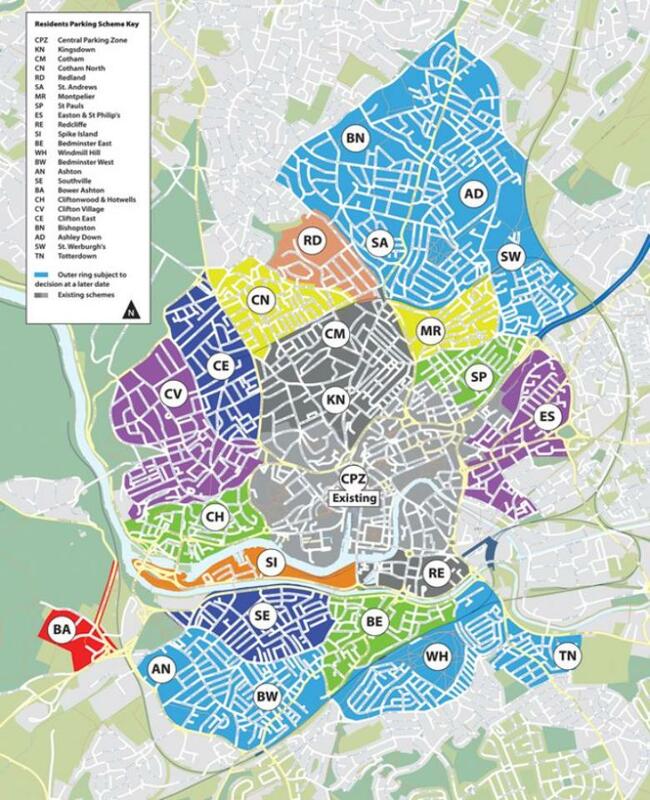 The map below shows these areas, it is a static map but there is an interactive map on the Bristol City Council’s web site which gives information on what is happening in your area. Land & Marine are carrying out upgrade works on the Bristol Water main trunk pipeline between Knowle and Clifton reservoirs. Contractors are currently on site in Upper Maudlin Street, adjacent to Bristol Royal Infirmary. Between now and Christmas, work will progress along Perry Road, Park Row, University Road, Elmdale Road and Tyndall’s Park Road. During this time, water supplies to University properties will not be affected. Full road closures are not expected but temporary traffic lights will be installed where required, including the junction of Park Row with Woodland Road. Contractors hope to reach the junction of Park Row with Woodland Road by Thursday, 12th September. 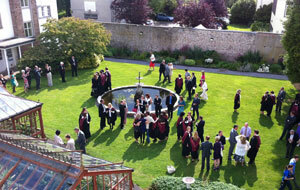 Those involved with the University Open Day on Saturday 14th September have been informed. For further information on when each road will be affected please view the programme plan provided by Land & Marine. The University will be informed of developments on a weekly basis as some slippage from the plan is likely and further updates will be provided as required. The Bristol Water main trunk project is totally unconnected to Bristol Water works currently taking place in Priory Road by their contractor, May Gurney. Double stacker cycle parking trial extended and feedback so far.. The double stacker cycle parking has been in place for a few weeks on the plinth outside Physics and several people have had a go and let us know what they think. Feedback has been positive with a few questions and some suggestions for slight improvements. John Wilford posted on Facebook "Like lots! Good use of space, easy to use, holds the bike well. Bring on the triple...!" Some users suggested a place to rest your bike while you bring the ramp down which is something we will discuss with the double stacker cycle parking providers. The main query was how to use the facility, there is a sign on the side of the facility which shows how to use it (a prominent metal sign will be used for any permanent facility) and a photo guide has been posted on our Facebook page. If a permanent facility is installed we will put a comprehensive Q & A page on our web page. We are considering replacing the current cycle parking facility with the red shelter in front of Physics with a 48 bike double stacker cycle facility which would be likely to include a shelter. We would especially like to hear from current users of this facility what they think of double stacker cycle parking. The trial of this facility will now be in place until 9th August 2013 after which time the facility will be removed. Let us know your thoughts or feedback on the double stacker trial for a chance to win one of several cycle accessory prizes (such as cycle bottle with in built lights! ).